Over the past ten years there has been a significant rise in the number of people who present to emergency departments with Lyme disease. Although some patients remain asymptomatic many present with a rash around a previous tick bite and others may present with a range of debilitating symptoms that can be problematic if left untreated. 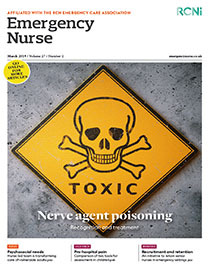 Due to the growing prevalence of Lyme disease in the UK and the US this article gives an overview of the vector-borne condition and provides emergency nurses with information about the pathophysiology, prevention, presenting signs and symptoms and management.